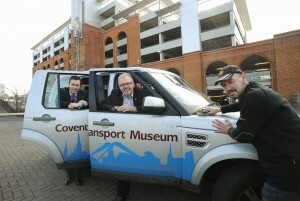 (l-r) Ian Clorley (Belgrade Plaza Partnership), Clive Skelhon (Coventry Transport Museum) and Ted Mihaylov. An automotive workhorse which takes some of Coventry’s classic cars around the UK has been given some loving care of its own at the opening of a new car wash in the city. The Coventry Transport Museum’s Land Rover Discovery tows classic cars from the attraction’s vast collection up and down the country to various events and services and is known as ‘The Workhorse’. But ‘The Workhorse’ took a rest from its taxing schedule to become one of the first customers of the new car wash at the Belgrade Plaza Car Park. Ted Mihaylov has set up the full-service car wash, on behalf of the Belgrade Plaza Partnership, and hopes to make a success of the business having previously offered a similar service in London. He said: “The new car wash caters for vehicles of all sizes and we do it all from a simple outside wash to a full valet. “I have worked at the Belgrade Plaza Car Park since it opened but before that I worked as a specialist valet in London so I enquired about the possibility of taking over the car wash space. “It is a great opportunity because it is the perfect place for people to drop off their car while they go shopping, go to work or whatever else they need to do. “They simply leave the car with me and I send a text message to let them know they can collect their car when it’s finished. “Hopefully this car wash will be part of Coventry’s future so what better way to start than to clean one of the cars that helps maintain its past. Ted can be found on floor 1A of the Belgrade Plaza Car Park and can be contacted at anytime on 07958211867.